This entry was posted in Paintings, Trees, Watercolor and tagged Autumn, nature, sugar maple, trees, watercolor by Jean Mackay / Drawn In. Bookmark the permalink. Lovely Jean. My year round eye level view living amid towering oaks, white pines and graceful birches doesn’t change much, except for loss of the leaves off the few maple, cottonwood and birches. I usually do focus in on studies of the bark outside my windows when working en Plein Air air is less appealing in the Maine winters. I’ve been playing with trees and sunsets in the snow and across the as yet unfrozen Pond. Was your background wash applied very carefully afterward, or tree masked before. So lovely. Still thinking about your Audubon workshop in Falmouth in Feb. loved learning from you at Hig zisland two summers ago. Hi Cheryl- Thanks for your note. I did the background wash of sky first, working in sections around the major branches and trunk (no mask). The smaller branches were done on top of that wash. BTW, the Falmouth workshop is full, but there may be a waiting list. It’s early, so I wouldn’t be surprised if there are cancellations in January. Happy Holidays! This is gorgeous. I applaud your patience. It’s also lovely to see a larger piece from you. And I see that there are more than six colors in your palette, too?! Though I still see a lot of mixing going on. Hi Beth- It was nice to do a larger piece and not have a gutter involved. And yes, my palette has expanded, but mixing is, of course, critical! I almost never use a straight-from-the-pan color. I enjoy winter trees – you can see the shapes of the trees framework that is hidden by the leaves the rest of the year. I love the symmetry and the asymmetry. The color of the bark. Seeing the vacant nests. It’s like you are seeing the soul of the tree. Hi Debbie- I agree. I’ve also enjoyed finding nests lately…will be painting those soon. Stunning light here – enchanting! Thanks Jacob. I definitely felt like I was chasing the light as it faded and the shadows changed throughout the late afternoon. I’m glad I managed to capture some of that glow. 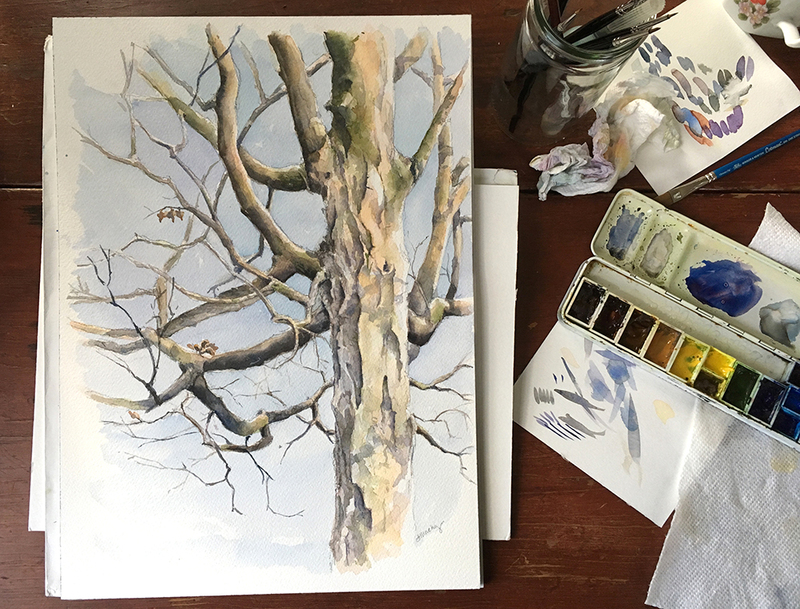 I have been avoiding trees lately, finding bare trunk and branches much too difficult to render. Now I’m not so sure – maybe I should give it a go … challenge myself – . It’s a worthy challenge. There’s a lot of detail, so if/when you get confused, stop drawing and look closely at what is happening– is the branch in front or behind? how is it connected? where is the light and dark? Use the spaces in between branches to help you draw the right angles and proportions. Maybe try just doing a section that interests you, rather than the whole tree to start. Enjoy! Realmente bonito. No tengo claro si una fuente de inspiración o de desesperación. Translation: “Really beautiful. I am not clear if a source of inspiration or despair.” Answer: inspiration. A perfect time will make a perfect painting. It comes from the heart through the hand and make our eyes wonder… !!! Thanks. I often think it flows the other way around…from the object of wonder through our eyes to the pen or brush in hand. So nice to hear…thank you! Love your capture of that November light. And again that mossy green tinge perfect! There is a lot of moss on this tree and the green tones added good interest and some warmth to the bark. I was thinking the same, particularly as I drove by this one tree, which has revealed the largest hornet’s next I have seen. I feel the owner should take the opportunity to remove it from said tree. Most hornets do not reuse their nests from year to year– a fact I didn’t realize until I brought a huge nest inside to sketch and did some research to be sure it wouldn’t spring to life. Hope that helps you enjoy the tree and the nest more as you drive by. Yugh! Springing to life. That would be terrifying. Yes, and also explains why he hasn’t knocked it down.